I just realized that I am in my 3rd trimester already! WOW! This pregnancy is flying by! I think a lot of the reason it is going by so fast is because of my just turned 2 year old daughter. She is fast, active, loves to climb, loves to explore, and keeps me going all day long. I don't have much time to sit and think about the baby on the way. Now that I know I am getting to the end of this pregnancy I know I need to get going with things. I am not due until Sept. but I have a lot to do so I better get working on it all now. 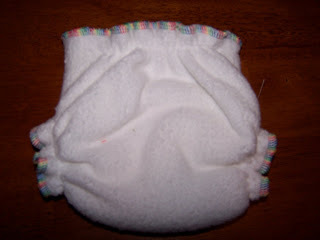 I made a fitted diaper. I made it to resemble a kissaluvs fitted diaper. My first try was UGLY! I walked away and tried again a few hours later and that one turned out a lot better. I need to put snaps on it yet. I don't have any tiny snaps for a newborn diaper. Once I get the snaps I will have 1 newborn diaper done. I will only have 5-6 dozen more to sew up. LOL! I think I can do a dozen a week without cutting into much of my day. I can cut them out when my children are playing nice together and I can sew them up fast when hubby is reading stories to the children at night. That is my plan anyway. I will let you all know how it works out. I hope to learn how to sew around corners with my serger soon. 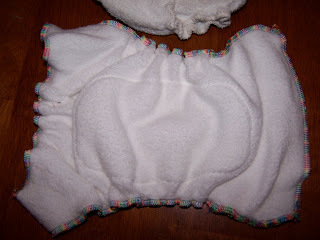 My diaper tabs are a bit ugly to look at. They have loose loops in spots. I think the diaper is usable so I am happy. 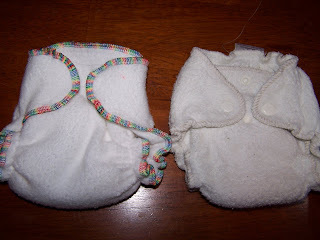 My diaper is on the left a Kissaluvs diaper on the right. they look close in size to me. Shot of the back. I can't remember my children being this small! I am starting to get very excited about the birth of this baby. The red spot is just a fuzzy (tiny piece of thread). BTW I know 6 dozen newborn diapers sounds like a LOT of diapers! I want to have enough for 2 days. I will wash them every day but I will need time for them to line dry and I want to have some for my daughter to use with her dolls. When my children are babies they seem to wet a LOT (more than other babies)! My daughter was using 3 dozen a day until she was well over a year old. I know sometimes a baby is born large and doesn't get to use NB diapers at all. That will be OK with me. I will give all my newborn diapers to my 2 year old for her dolls. When I was 2 years old my mom gave birth to my sister. I got a new doll (baby alive). When my Mom gave my sister bath I gave one to my dolly. When my Mom changed my sisters diaper I changed my dolls diaper. I hope if I do this kind of thing my 2 year old will adjust well to the new baby (not get jealous) and give me the time I need to care for the new baby.